So, it's probably no surprise that in 2016 they released a game based off another hugely popular comic book character: Batman. Five episodes were released starting with the first episode "Realm of Shadows" in August and ending with the final episode "City of Light" in December. Just like most of Telltale's games since 2012, Batman – The Telltale Series is a cinematic adventure experience meaning most of the gameplay involves very basic puzzle solving by oldschool point 'n' click adventure standards, plenty of Quick-Time Events (QTEs) and lots of choices that causes the story to divert down different paths. While I already have quite a few Telltale adventure games I still didn't have Batman – The Telltale Series nor did I have Minecraft: Story Mode. So when a Humble Bundle came out in July last year that offered these games and more for USD $15, it seemed like too good a deal to miss. Just about everyone is a fan of Batman so I was also curious to see what a Telltale treatment of the franchise would be like. The game introduces you to a lot of familiar faces such as Alfred, Commissioner Gordon (before he becomes Commissioner), Catwoman, the Penguin and Harvey Dent – however there are so many twists and turns in this adaptation of Batman that it'll keep you on the edge of your seat. Nothing like finishing an epic comic book hero adventure with a nail-biter of an ending. 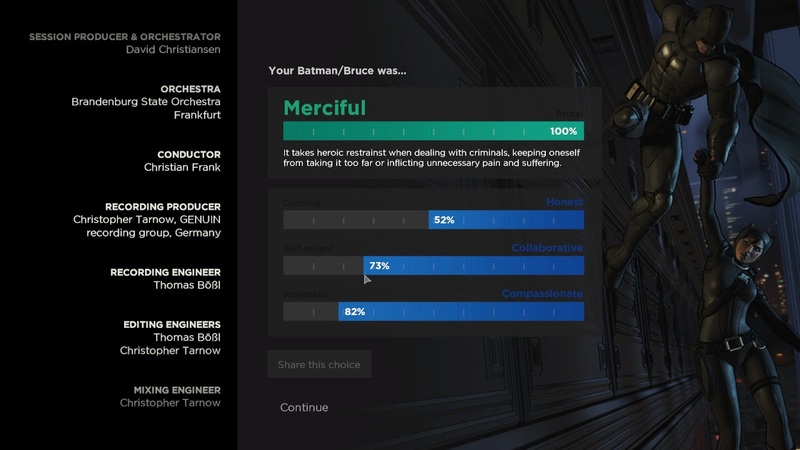 Similar to what was introduced in the epilogue for Game of Thrones – A Telltale Games Series, the end of Batman - The Telltale Series analyses the choices you made during the game and determines what sort of Batman you were (i.e. whether you were a merciful Batman and whether you relied on honesty, collaboration and compassion or cunning, self-reliance and pragmatism). In all the Batman movies, TV shows and cartoons I've watched (which admittedly isn't many), Bruce Wayne isn't even considered a real option when dealing with the crime that plagues Gotham City: it's always Batman that saves the day, not Bruce Wayne. In Batman – The Telltale Series there are pivotal points in the game (including the game's ending) where you can actually choose whether to deal with the issue as either the masked vigilante or the CEO of Wayne Enterprises. 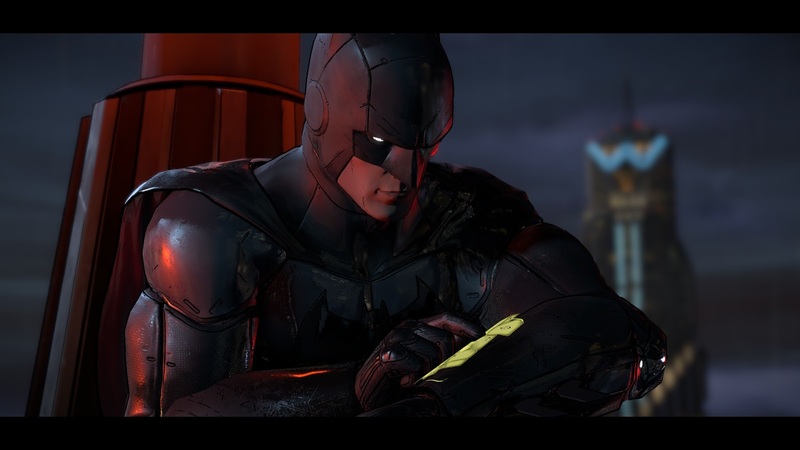 In Batman – The Telltale Series, it's not as obvious who the good guys and bad guys are. Instead of your one-dimensional good vs evil plot you often see in superhero comics, movies, TV shows and games, you tend to feel more sympathetic for the villains as some of their motivations are even noble, to a degree. Jared Emerson-Johnson does it again, giving us an awesome soundtrack to listen to. I love the Main Menu music; it sounds like a mix of Danny Elfman's 1989 Batman theme and maybe, Jack Wall? 80s sci-fi? I'm definitely getting a Mass Effect vibe to it too. 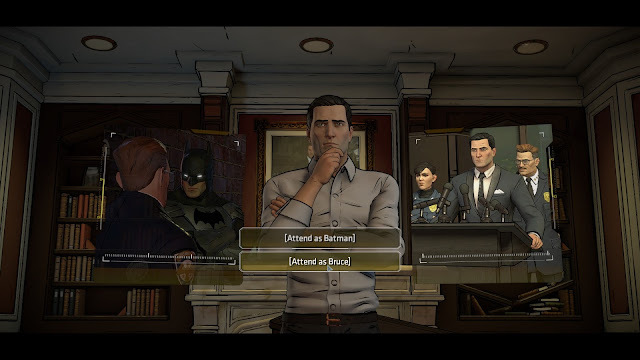 Puzzle solving is still relatively simple compared to point ‘n' click adventures but it's a bit more involved than previous Telltale adventures since The Walking Dead since in Batman – The Telltale Series, you have to link pieces of evidence at crime scenes in order to figure out what happened. I love the frenetic combat as well as the ability to plan attacks; it actually reminds me of the movie "Sherlock Holmes" with Robert Downey Jr. where Holmes runs through the multiple steps to incapacitate his foe in his head before executing the plan. The game works pretty well on the Steam Link when it lets you. I believe the game only works on whichever controller is considered the primary controller so make sure you remember which one that is. Just like many Telltale games I've played, Batman – The Telltale Series is another one that happens to be plagued with laggy animations and lip synching issues. The music in the game tends to cut off at the wrong times (i.e. either too early or too late). Batman – The Telltale Series is probably the best version of the Batman story I've experienced in any media: the multiple plot twists, tragic villains you feel sorry for and the exploration of the thin line between good and evil are really what makes the game stand out. To complement the gripping plot, the game has a top-notch soundtrack by Telltale's composer, Jared Emerson-Johnson and there are even some minor tweaks to the gameplay thanks to the new crime scene investigation and attack plan segments. Unfortunately, the game does suffer from what every Telltale adventure I've played since The Walking Dead suffers from which includes laggy animations, lip-synching issues and audio issues. If the game were better polished, it would've received a higher score but even in its current state, I would still recommend it. Is the game worth $24.99 USD? : Yes: that's just under $33 AUD for one of the most interesting takes on the Batman story I've experienced.